One of the best-known plant selections to emerge from Washington Park Arboretum is Mahonia × media ‘Arthur Menzies’ (or Berberis × hortensis ‘Arthur Menzies’, if you go by what botanists are calling it these days). First described by Joe Witt in the spring 1967 edition of the Arboretum Bulletin, the plant is named for a former supervisor of plant accessions at San Francisco’s Strybing Arboretum, Arthur Menzies, who in 1961 sent seedlings raised from Mahonia lomarifolia plants in his garden to Washington Park Arboretum. After growing these seedlings for a year, our Arboretum staff noticed that one of them was—as they say on Sesame Street—not quite the same. It had foliage more reminiscent of leatherleaf mahonia (M. bealei), a Chinese species like M. lomarifolia, but a much more cold-hardy one. The Arboretum folks suspected they had a hybrid on their hands, and their suspicions were strengthened a few years later when cold December temperatures turned all the sister seedlings into mush, but left the mystery plant relatively unharmed. ‘Arthur Menzies’ in bloom in December along Arboretum Drive, near Rhododendron Glen. 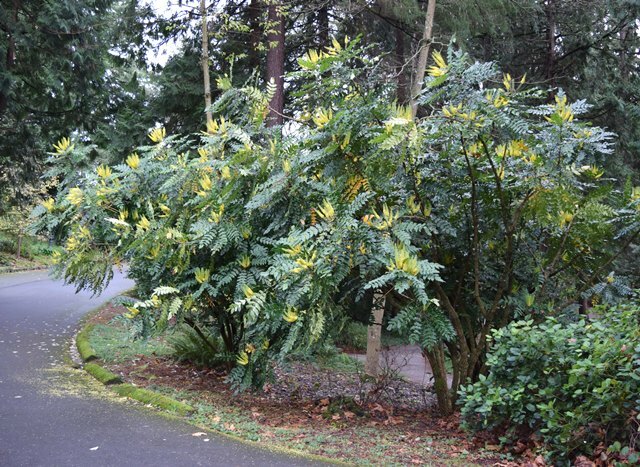 Following further investigation, Arboretum staff concluded that their new mahonia was indeed a chance hybrid of the two Chinese species (both of which were planted in Menzies’ home garden). 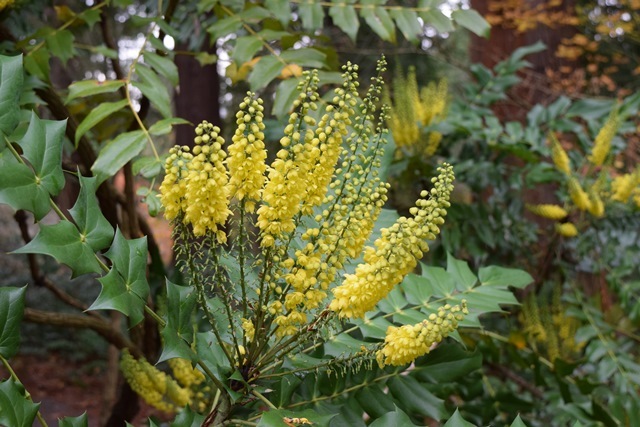 They named it Mahonia ‘Arthur Menzies,’ and it has gone on to become a much-admired plant in garden club circles, though some enthusiasts feel it hasn’t quite gotten the widespread attention it deserves. In the trade, the plant is most often sold as a cultivar of M. × media (along with the popular ‘Charity’ and ‘Lionel Fortescue’), implying that the parents are actually M. lomarifolia and M. japonica. Unless you’re a taxonomy geek, all of this naming stuff can get boring very quickly, but suffice it to say that M. bealei and M. japonica are thought to be pretty much the same species (the wild type versus the horticultural form, respectively). In the end, all that really matters is that ‘Arthur Menzies’ is a stunning plant with some unique features. Mahonia blooming in the Witt Winter Garden. A large evergreen shrub, it grows up to 10 feet tall and 5 feet wide, and produces big, bold, compound leaves composed of numerous barbed deep-blue-green holly-like leaflets. Spectacular sprays of fragrant, lemon-yellow flowers appear atop the plant in midwinter and are magnets for Anna’s hummingbirds. The flowers develop into sumptuous clusters of grape-like waxy blue-purple berries by summertime. Distinguished from its seed parent (M. lomarifolia) by its greater cold-hardiness and from its putative pollen parent (M. bealei) by its significantly greater vigor in the Pacific Northwest and earlier bloom time, ‘Arthur Menzies’ also stands out from other M. × media cultivars because of its more dramatic foliage, vigorous growth, and very frost-resistant flowers. The plant is best grown in evenly moist soil and partial shade, with protection from winter winds. Though the original selection is no longer living, a number of fine specimens can be found in the Arboretum. A particularly good one can be seen growing on the north side of the Witt Winter Garden. —Excerpted from “Five Fabulous Garden Plants Introduced by the Arboretum,” by Niall Dunne and Randall Hitchin; Arboretum Bulletin, Summer 2009.